UK, Czech Republic, 2016, 120 minutes, Colour. Cillian Murphy, Jamie Dornan, Toby Jones, Bill Milner, Charlotte Le Bon, Anna Geislerova. There have been a number of films about Hitler’s occupying of Czechoslovakia, the sending of his lieutenant Reinhold Heydrich to Prague and his ruthless control of the Czech population, leading to a plot to assassinate him, ultimately successful, but drawing down enormous reprisals, especially on the village of Lidice. Even during World War II, there was already a film highlighting this, Hitler’s Madman. In the 1970s, there was a reconstruction of the episode, a focus on the young men, Czechoslovakians, parachuted in from London who were to do the execution. This was shown in an effective film, Operation Daybreak, directed by Lewis Gilbert. Kenneth Branagh played Heydricj in Conspiracy. 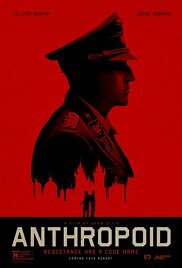 It is interesting to ask why there has been this renewed interest in the events more than 70 years later in Operation Anthropoid. Cillian Murphy and Jamie Dornan portray the two young men parachuted into Czechoslovakia by night, injuring themselves in the fall, picked up by a partisan who is willing to betray them to the Nazis, taking his truck, driving into Prague where they find that their contact has disappeared. Nevertheless, they are received by the local Resistance, especially by the veteran Uncle, Toby Jones, and find accommodation with a family and the support of two young women. Cillian Murphy portrays the leader, a stern man, committed to his mission, allotted a young woman to help him with his cover, becoming emotionally attached to her and grieving at her death during the execution of the mission. Jamie Dornan, on the other hand, falls in love with his young woman and has moments of fear and doubt. The film shows Prague and the ordinariness of its way of life, even the trams running on the streets, during the Nazi occupation. When Heydrich is to return suddenly to Berlin, the time of the attack is advanced, double checking with the authorities in London, some of the locals wondering why they are prepared to kill Heydrich and risk the reprisals which eventually take place. In many ways the attempt was botched, a gun jamming, explosives thrown, Heydrich not immediately dying, a pursuit of those responsible, betrayal by one of the locals who was also tortured, and escape to safety in a church and a siege which, in real life, lasted for six hours, before the attackers were all killed. The massacre in Lidice is mentioned but not visually shown – rather, the suffering of particular individuals is highlighted and visualised, the siege in the church, and the taking of suicide pills. World War II stories and films continue to be of great interest – and, as the decades go by, probably a necessary prodding to memory and sensibilities. 1. A World War II story? Of significant events in Czechoslovakia in 1942? Audience knowledge of these events? 2. The opening explanation, the Treaty of Munich, the occupation of Czechoslovakia by Hitler? The appointment of Heydrich, the executions, the strict regime, personal harshness? The plan for his assassination, the personnel, the Resistance, the execution of the plot, the severe reprisals? 3. The Czech locations, the forests, houses, the countryside, the city of Prague, the ordinary aspects, day by day existence, trams going through the streets? The occupation? The apartments, the church and the basement? The musical score? 4. The action in the film, the parachute drop, rescued, the betrayal, driving to Prague, the assassination plan, the involvement of the Resistance, the attempt, the details of the attack on Heydrich’s car, the guards and the pursuit? The impact of the siege in the church? The picture of torture, suicide pills? 5. Jan and Josef, their backgrounds, going to England, landing, the injury and the sewing up of the foot? The rescuer and his phoning the Nazis, deaths? The truck, going into the city, the contact missing, the lessening numbers of the Resistance? The apartment? The parents, the welcome, the boy and his violin talent? Maria, the attraction to Jan? Lenka, involved, attachment to Josef? And his getting Lenka to slap him? The women upset about the plan, their role in the execution of it? 6. The hastening of the plan with hatred leaving? The timing, the men at their position in the streets, the signals? The attack, the jamming of the gun, the buying of the explosives, uncertainty as to Heydrich’s death, the flight of the streets, the escape? The decision to leave, the men who had been parachuted into Czechoslovakia? The priest, offering the church, his friendliness, the discussions, especially the nature of suicide? 7. The six hours’ siege, attention to detail, weapons, hoses, the Nazis and inserting them in the water dousing the men? Those in the balcony, in the basement? Deaths? Suicide pills? 8. The man who betrayed them, not participating plot, going to the authorities, the reward, was being tortured, taking into the apartment? 9. The mother in the apartment, taking her son? The interrogation, staunch, the suicide pills? The boy taunted, his violin smashed? 10. The importance of the reprisals in Lidice, not visually shown but reliance on verbal information? The concentration of the violence on the torture of individuals? 11. The resistance and Uncle and his support? The other members of the group? The local leader, his not approving of the assassination? The other suspicious of him? The delays with contacts with the authorities in London? 12. Czech authorities in London, not on the spot, the decision that Heydrich should die, how much consideration reprisals? 13. The film made almost 70 years after the events, the intention of the film?